Dimensions: 17.75" x 33.5" x 57.25"
Your dorm closet will definitely be better than your closet back home. In fact, you might be able to fit only about half your wardrobe. No matter if you're a guy or girl, that closet won't cut it if you're bringing the array of outfits that you'll need throughout college life. There are ways to give your dorm closet more space with various hanging shelves and basic hangers for college. But then there's another solution: the Extra College Clothes Rack. This external clothes rack is like having a second whole closet! Since hanging your clothes is ultimately the easiest way to keep track of your clothes and to quickly pick out your outfit, this clothes rack is one useful dorm supply to include on that ol' college shopping list. You can also organize your clothes based on how much you wear certain garments. 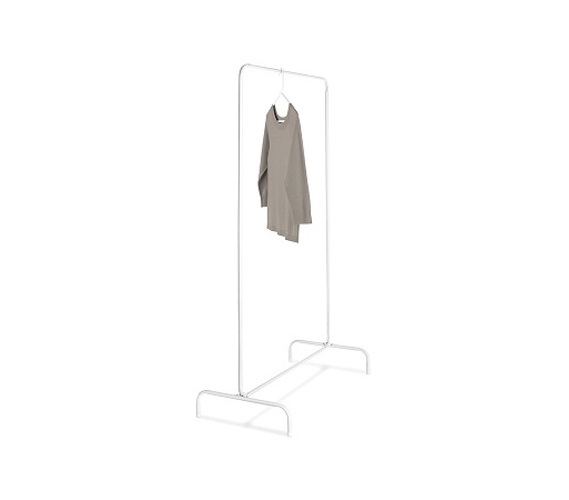 Keep your everyday clothes hanging right on this rack and your nice, better clothes tucked safely in that little closet. There's just too much time that can be wasted if you have to sort through so many clothes each morning just trying to find a matching shirt; so instead, double your closet space and free up some time! An organized dorm room, after all, starts with keeping that closet clean. Clothes strewn about are often the main offender in a messy dorm, so keep things under control with this Extra College Clothes Rack.